Inspection and Maintenance Services- Ontario Power Generation Inc.
A large variety of linear defects - as nature, size, shape, orientation and location - machined in turbine components and bar specimens were investigated by phased-array ultrasonic techniques: specular, skew and back-scattering. Defect size (length x height) range is between 2mm x 0.5 mm, 9 x 0.15 mm up to 115 mm x 14 mm and 96 mm x 17 mm. The study is focused only on 3-D crack-like EDM notches and fatigue, SCC and corrosion fatigue cracks. Some defects were known as size and location; the others were detected during the large-scale in-situ inspections. All defects analyzed were confirmed, at least for one dimension (length) by magnetic particle inspection, metallographic replicas and some were fractured for failure analysis studies. Defects in high-pressure turbine components were confirmed by grinding and gauging measurement. The experimental PA UT results are compared to actual defect size under a capability demonstration program. Representative results are presented and discussed. It was concluded the phased array ultrasonic technology is capable of detection and sizing very small cracks within specific tolerances: 3 mm for length; 1.2 mm for height and 3 mm for location. Inspection and Maintenance Services used phased array ultrasonic techniques since 1996 for examination of L-0 blade roots of ABB/Alstom low-pressure turbine. 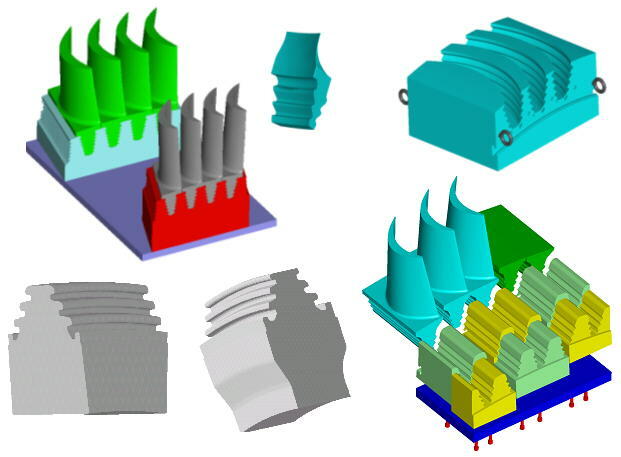 The feasibility study results, capability demonstration on GE disk rim attachments and field applications were published at EPRI Steam Turbine Workshops [1, 4, 10 ], EPRI Phased Array Seminars [ 2, 7, 9 ] and International, European and Wolrd NDT Conferences [ 3, 5, 6, 8, 11-13 ]. This paper is presenting a summary of the lab and field results grouped on three topics: detection and sizing capability of fatigue cracks on straight bars, capability demonstration/procedure validation on linear defects in low-pressure turbine components, and detection and sizing of fatigue and stress corrosion cracks (SCC) on turbine components. A comparison between signal display from 3-D crack-like EDM notches and real cracks detected in specific items is also presented. The samples used for crack detection and sizing are presented in Table 1. Crack shape for some of the samples is illustrated in Figure 1. Figure 1: Examples of crack shape and their height in straight bars. The detailed results were published and presented at the 16-th WCNDT-Montreal [ 11 ] . The results could be summarized in crack detectability curves for shear and longitudinal waves (see Figure 2). Figure 2: Crack sizing capability for phased array techniques: a) shear waves; b) L-waves. Examples of sizing capability are presented in Figure 3 and Figure 4. Cracks with height as low as 0.6 mm could be sized. The crack tips are generally 12 dB above the noise. Crack orientation and branches could be displayed by high frequency L-waves phased array probes. Figure 3: Examples of crack height measurement using volume-corrected sectorial scan. a) H PA = 0.8 mm; Hcrack = 0.6 mm in bar #4; b) H PA = 1.4 mm; H crack =1.2 mm in bar # 12. Figure 4: Detection, sizing and crack comparison with S-scan display of LW phased array probe. Low-pressure turbine components require (rotor steeple grooves, blade roots, disk bore, disk rims and anti-rotating holes) phased array inspection for detection and sizing of possible service-induced cracks. Lack of representative samples, defect population, and systematic studies on possible failure mechanisms led to a sketchy procedure qualification. Most of ISI groups, including OEMs ones [14-20] are qualifying the procedures on EDM notches. Little to none data are reporting on service-induced cracks, corrosion pits, missed cracks and false calls. De-blading and MP/replica inspection are costly, but they are the only ones to confirm the capability / reliability of in-situ (on powered stands) phased array inspection. There is no Designated Qualification Organization and most of Design Responsible Organizations (DRO) issued the inspection specification based on phased array detection capability on EDM notches. 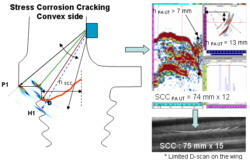 Stress corrosion / corrosion fatigue cracks artificially induced on steeple grooves, disk rims blade roots, disk keyways are very costly and hard to be controlled and QA documented. Confirmation of phased array calls requires physical destruction of the sample and unavailability for the next service provider or for procedure re-qualification when some essential parameters were improved (changed). The qualification of phased array procedure for low-pressure turbine components is lacking the process. The reasons mentioned above lead to the concept of capability demonstration, not to performance demonstration. The most common sensitivity adjustment is to set the noise level on the components at 10-15% and report indications with SNR > 3:1 (10 dB) above this level. This conservative approach led to false calls and costly de-blading. 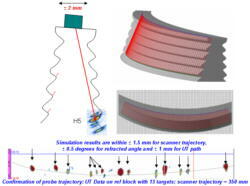 On the other side, missing the real SCC, which might be detected by MP inspection after de-blading operation, will put the reliability of phased array ultrasonic techniques in jeopardy. Figure 5: Example of low-pressure turbine components and their complex shape. Technical meetings with OEM, Fracture Mechanics Engineering Group and Power Train Engineering. Adopt ENIQ[22-25] approach (minimum three targets, technical justification, simulation of inverse problem, assess essential variables, probe characterization, increase the population of 3-D crack like defects, retire-for-cause items with real defects, refine the techniques and scanners performances to avoid false calls and/or missed cracks). Perform open/blind tests on large variety of EDM notches in reference blocks and realistic mock-ups. Get information from EPRI NDE Centre for GE and Westinghouse turbine failure mechanism and phased array inspection guidelines. Perform open/blind tests on retire-from-service items with fatigue/SCC, corrosion pits. Probe-defect relationship was established based on Imagine 3D and Simulation module. An example is presented in Figure 6 and Figure 7. The high-speed productivity was based on optimizing the probe trajectory, the number of useful angles and the scanning ultrasonic range. Customized analysis tools were developed for general and specific defect evaluation. Figure 6: Example of simulation probe-defect position for L-1 steeple inspection. Figure 7: Example of probe trajectory optimization to detect linear defects on hook 5 convex side using simulation (top) and confirmation with UT data on development block (bottom). An example of capability demonstration on three-target qualification for L-1 steeple [Alstom turbine of 900 MW] is presented in Table 2 and exemplified in Figure 8. PDI block with three targets: 3x 1 mm. 4 x 1.5 mm and 6 x 2 mm*. *The results were based on six scanning / target by three technicians in blind test, no time constraints. Figure 8: Example of sizing of 6 x 2 crack-like EDM notch on L-1 steeple hook 1-[Alstom turbine of 900 MW]. Left: PDI block #2 with four targets; right: S-Scan sizing as 7.2 mm x 2.3 mm. Figure 9: Example of detection and sizing of crack-like EDM notches on L-0 blade. Top: PDI block #2 with 10 x 2 mm targets-left- and UT data-right; bottom: example of OMNISCAN and FOCUS sizing. Similar results were obtained on L-0 blade and L-0 steeple PDI blocks (see Figure 9 and Figure 10). Checking for possible missed cracks: IMS performed in summer 2001 a large-scale inspection on one of LP rotor blade roots and rotor steeples (hook 1). The rotor was inspected in the Central Maintenance Shop, on power stands (see Figure 10b) and PA inspection results reported no cracks. The LP1 rotor was installed in the unit, and unit was synchronized to the grid. Later on, in cracks were detected on blades from another two rotors - LP2 and LP 3 of the same unit, during the routine maintenance operation. Questions were raised: what if PA inspection was not reliable, and small fatigue cracks may be missed in LP 1? OPG decided under a conservative approach to stop the unit next year and to deblade row 10 on both turbine and generator end (216 blades) and check all blade roots for possible missed cracks by phased array ultrasonic inspection. The operation took place in summer 2002. Before de-blading, PA inspection was performed with an improved procedure. No cracks were reported on row 10 blades. All blades were pulled out from the rotor disks and checked with MP. No cracks were found, as PA already reported in 2001 and summer 2002. This event gave station and insurer a high confidence in the reliability of PA ultrasonic techniques. Figure 10: Example of reverse engineering of SCC (left) on L-0 steeple; Comparison of UT result on 3-D complex EDM notch with crack signal is very similar (right). Figure 10b: Manual phased array inspection of row 10 blade roots and rotor steeples in summer 2001 (right) and their complex geometry (right). Examples of this inspection are presented in Figure 11 - 13. 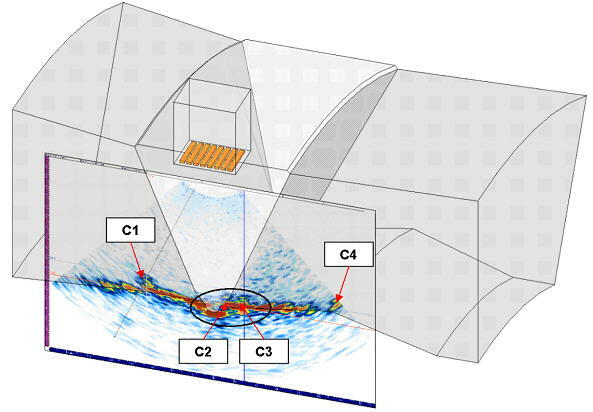 Figure 11: Detection and sizing of multiple small fatigue cracks by phased array (a). Confirmation of four cracks of 15 mm (total length) by MP detection (b); Fracture mechanics analysis (c) and comparison between fracture mechanics and PA results (d). Figure 12: Example of comparison between fracture mechanics (right) and phased array crack height evaluation (right). Figure 13: Confirmation and sizing of SCC on blade convex side by wing technique (left and upper right). Comparison with MP and fracture mechanics data (left). In-situ crack detection and sizing: Large-scale inspections were performed between 2001-2004. Service-induced cracks were reported on different low-pressure components. Each phased array call was confirmed by two complementary techniques and by additional special automatic/manual set-ups. Data analysis was performed by 4-5 people (acquisition technician, 1-st analyst, 2-nd analyst, resolution analyst and technical expert) for the final crack reporting number to the station. Figures 14-16 illustrate some of SCC and fatigue cracks detected in rotor steeple grooves and blade root and confirmed by MP and replica inspections. Crack depth was measured after grinding and final MP inspection. 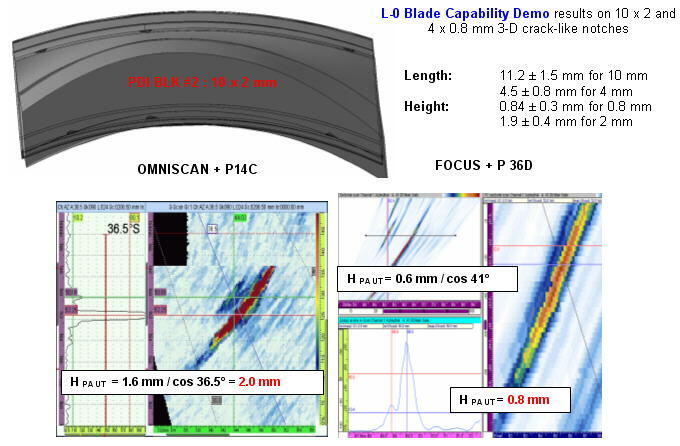 Some blades were not repaired or cut for metallurgical investigation, so only length was compared to PA data. Figure 14: Crack detection principle (left) and PA display (middle), MP confirmation (top right) and crack morphology taken by MAG rubber replica (bottom right). Figure 15: Detection and sizing of SCC on rotor steeple (left). Confirmation by MP inspection and metallographic replica (right). Figure 16: Detection and sizing of SCC on rotor steeple (left). Confirmation by MP inspection after de-blading (right). 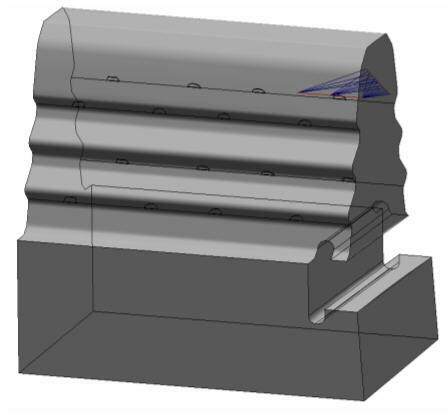 Figure 17: Data plotting into isometric view of the header welds with four thermal fatigue cracks. 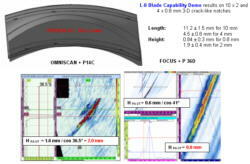 Figure 18: Omniscan (left) and Tomoview (right) crack data plotting into isometrics of L-0 blade and L-0 steeple hook 1-Alstom low pressure turbine of 900 MW. 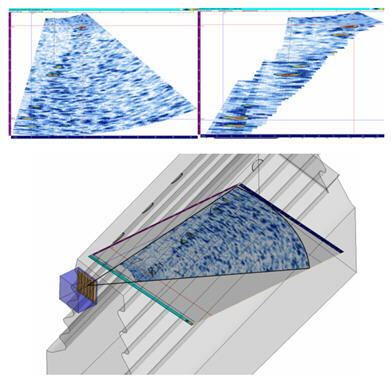 Figure 19: 2-D Tomoview data optimization (top ) and data plotting into row 9 steeple calibration block for hook1 - Siemens low-pressure turbine of 580 MW. Two cases are presented in Figure 20. In both cases IMS was asked to size the crack height, so the station could take a decision for grinding or cutting and re-welding. The PA results were confirmed within 1 mm by grinding and gauging measurements. 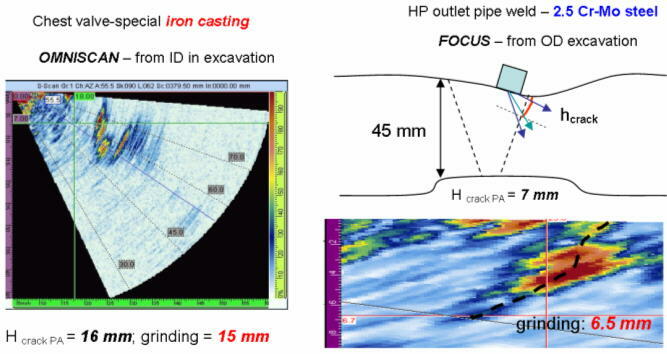 Figure 20: Sizing cracks in HP turbine components within 1 mm accuracy. Crack location on complex geometry components is within 3 mm. The author wishes to thank: OPG-IMS Management for their support and granting the publication / presentation of this paper. Many thanks to IMS technicians and external contractors which participated in feasibility studies, capability demo, procedure(s) validation, field inspections and defects confirmation / reporting using phased array ultrasonic technology during 2001-2004 inspection campaigns. Special thanks to OPG Pickering and Darlington Turbine Equipment Departments and Bruce Power Turbine Group for their support in funding the application of phased array technology for turbine components. Thanks to: SITCO, CAD WIRE and Focal Point NDE for reverse engineering, complex EDM notches manufacturing and CAD drawing integration into Ray tracing / simulation software Imagine 3D. Special thanks to CadWire for plotting 2-D PA data into isometric part. Lamarre A., Dubé, N., Ciorau, P.: " Feasibility study of ultrasonic inspection using phased array of ABB L-0 blade root - Part 1" -5-th EPRI Workshop for Steam Turbine and Generators, Florida, July 1997. Ciorau, P., Macgillivray, D., Hanson, R.: "Recent applications of Phased Array Inspection for Turbine Components'-7-th EPRI Steam Turbine and Generator Conference-Nashville, August 2003. ENIQ Document: "European Methodology for Qualification on Non-Destructive Tests" EUR 17299 EN, 1997. ENIQ Recommended Practice #2: "Recommended Contents for a Technical Justification", Issue 1, Report 4, EUR 18099 EN, 1998. ENIQ Recommended Practice #3: "Strategy Document for a Technical Justification", Issue 1, Report 5, EUR 18100 EN, 1998. OPG-N-PROC-MA-0051: "Qualification of Non-Destructive Examination Processes" [internal distribution], 2001. Ciorau, P., L. Pullia: " Phased Array Ultrasonic Inspection: A Reliable Tool for Life-Assessment of Low-Pressure Turbine Components. IMS Experience 2001-2005"-Proc. EPRI 9-th Steam Turbine Workshop, Denver, Aug.22-2005.